Disclosure: This post is sponsored by Fred Meyer. All opinions and styling are my own. You all know I have struggled with this little corner of our family room for some time. I have been on the hunt for the perfect piece above the couch and possibly switching out the rug as well. I mean it’s been about 2 years so it’s time, right? So obviously I hopped on my computer for a little online browsing to find the perfect fit. I was so excited to find out that Fred Meyer Stores just launched Fred Meyer Direct so I can now buy home goods and electronics online and have it shipped directly to my doorstep! I have always loved their decor in-stores, and even better now that I can browse online. 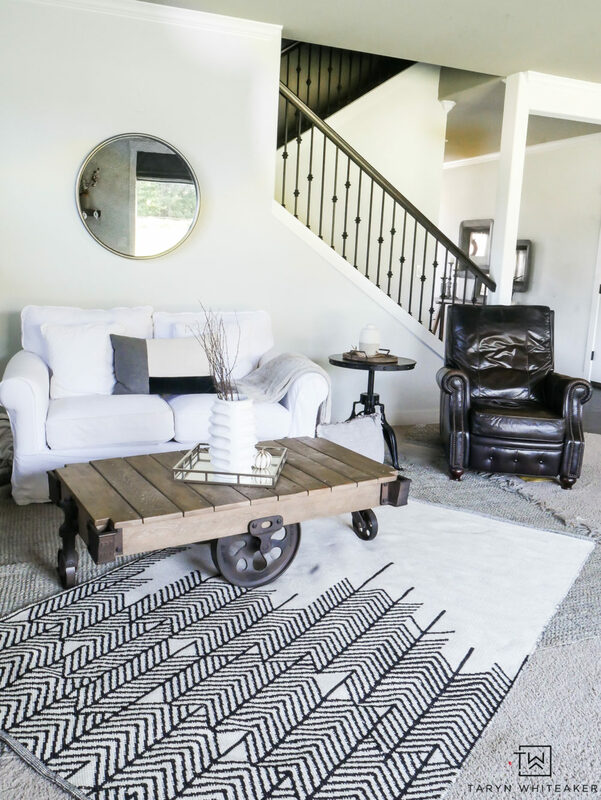 So are you ready to see my new Black and White Family Room Updates? Don’t you love the new updates in here? Two small changes that I feel have made a big difference. I think the mirror is such a great fit for this space. It bring some more metal elements into this corner, and also brings more light with the reflection. All my packages arrived perfectly to my doorstep! You guys, Fred Meyer Direct is the way to go if you have little kids and have a hard time taking them into the store with you, not to mention it simply saves time no matter what stage of life you are in. Shopping online for home decor has turned into my main way to shop for furniture and decor these days. I truly enjoy that time at night when the kids are in bed and the house is quiet and I can actually sit on my comfy couch and process how I want a room to look without any distractions. I love browsing through pages of products and picking the perfect pieces for my space. And this time, both pieces turned out EXACTLY like I had expected. The colors were perfect and it made the whole thing so easy. Sometimes you need to turn your house into a jungle gym in order to get something just right… right? Just don’t tell my kids. 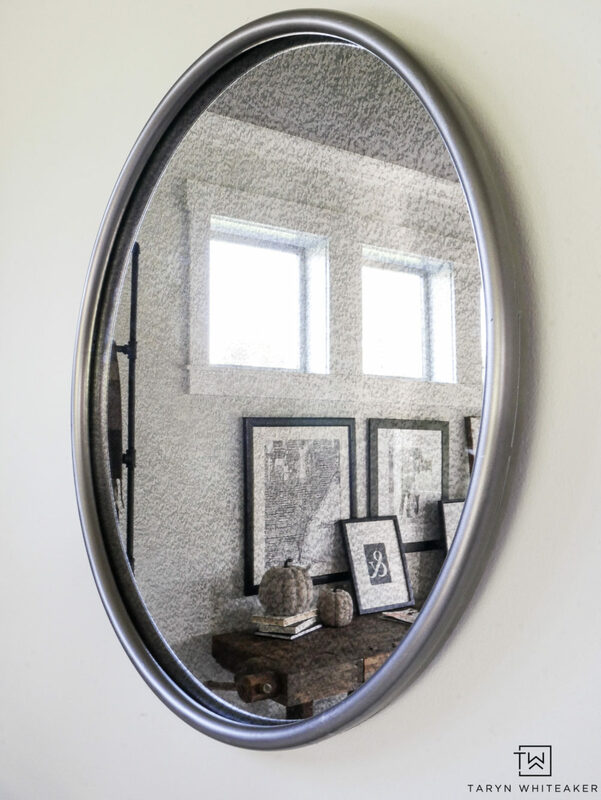 What I love about this round mirror is that is has the perfect industrial look. I wouldn’t consider it galvanized, it’s a true gun metal finish. And the mirror has an antiqued finish. Giving it a really cool look, perfect for this corner. I am all about layering rugs. I think it makes the space feel so cozy and also brings a lot of dimension. I was looking for a rug with a little patterned to it and this black and white woven rug couldn’t be any more perfect. I an pretty particular about the material of my rugs and this woven one blends so well with my existing ones in the house. I got the 5X7 for this space. I wanted something little smaller to layer on top the existing one. Time to sit back and relax in this cozy space and do a little more online shopping with Fred Meyer Direct . I think a need a new lamp here, what do you think? Head to Fred Meyer Direct to start updating your space, every time I look at their site they have so many new products available and they often run 15% off promo codes! 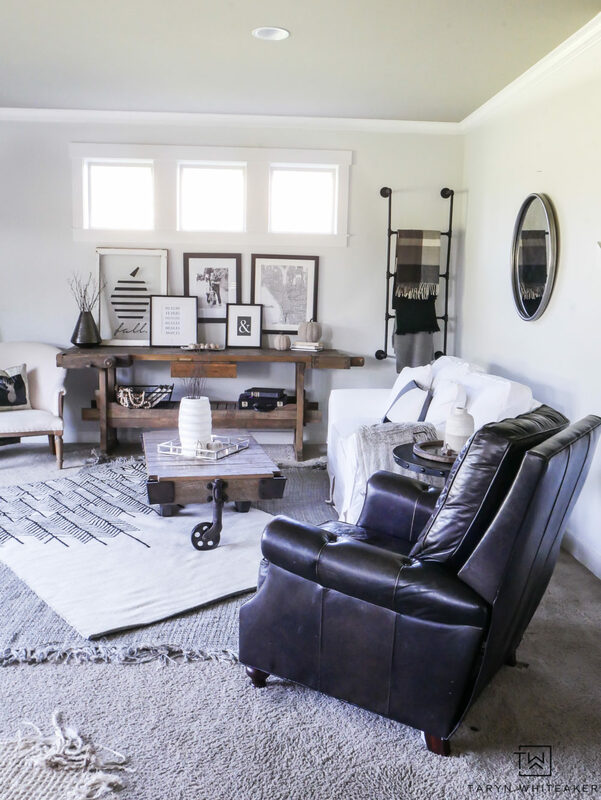 Love how you styled your family room! The black and white theme looks very sophisticated and elegant. It opens up space and makes it appear brighter. The mirror truly adds some industrial vibe to the whole concept. 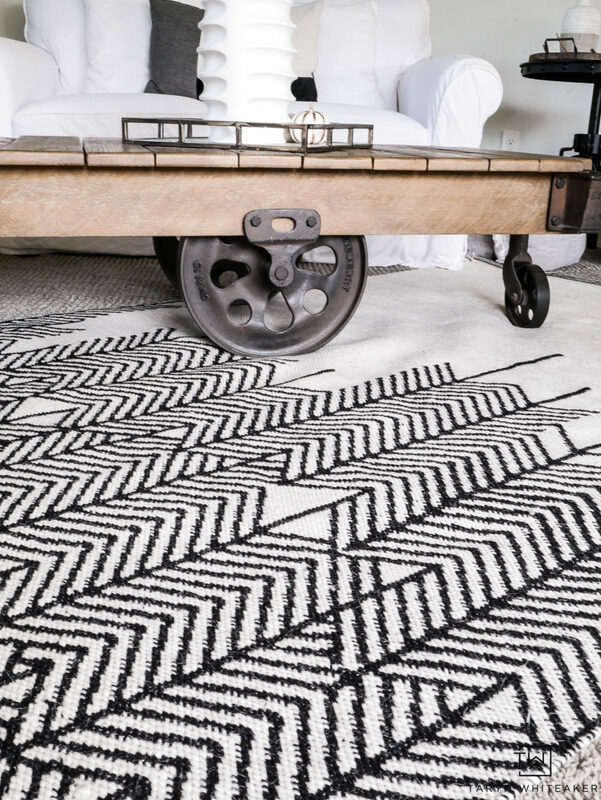 Tribal patterns rugs are always a beautiful choice, especially when there are a tradition and a story behind them, like behind the Moroccan Beni Ourains. The styling is great…but layering rugs could only work for rooms that are never used. How on earth would you or your guests keep from tripping over them? Thanks Nancy! I actually have layered rugs in almost every one of my rooms and I’ve never had any issues with people tripping over them. It might be because we don’t allow shoes in our house or maybe because they are all pretty thin?